``There is no city without a fortress``, an old proverb says. Icheri Sheher (Inner City) is a landmark of Baku. As all ancient fortresses, the Baku fortress was built to defend the rich developing city from foreign invaders. The city, built on a high hill in the form of an amphitheatre, is exposed to the sea in the lower part, and is surrounded by the Caucasus Mountains in the upper part. With its triple row of fortress walls, the Maiden Tower and other fortification facilities, The Old City appeared to be an impressive stronghold. Like other medieval towns, all the buildings within the fortress walls of Icheri Sheher were of a defensive nature in terms of their tactical and strategic functions. The urban pattern of the city suggested a real labyrinth. Large squares and wide streets gradually narrowed and shrank into a geometric design that allowed the full involvement of residents in defensive activities. 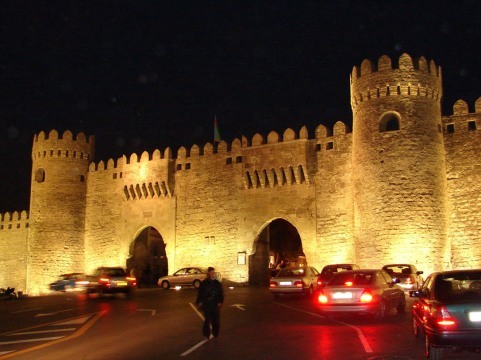 Nowadays, the fortress wall of the old city of Baku enable the preservation of the medieval image of the old town, with its numerous lanes, snaking streets and the flavor of an oriental city. Fortresses have passed many centuries fulfilling their historical functions. Firm walls, huge towers were not only the means of security, but also symbolized a dignity and magnificence of the city. Some of them were razed to ground, but others could stand the trials and survived. Now they are admiring for their steadiness, sustainability and uniqueness. Baku, the largest city on the Caspian Sea shore, like all others ancient cities has its own unique architecture. There are no old cities without fortresses, towers and other fortifications. It is obvious why the ancient people associated the conception of a city with fortresses, both in Azerbaijan and in Middle Asia, the concepts ``fortress`` and ``city`` often signified the same notion. The age of Baku city, like the age of the most of the ancient cities of Azerbaijan is unknown. The researchers consider Baku to be one of the cities which Ptolemy noted in the ancient Albany cities list. According to one of the inscriptions, Baku was said to be founded in the period of reign of Manuchehr Shirvanshah III (12th century), but there is no doubt that Baku had more ancient defensive works even before that period. Baku Fortress - Icheri Sheher (the Inner City or the Old City) - was surrounded with single walls along the seacoast and with double walls in all other places. The walls, in turn, were enclosed from outside by deep, wide moats. In fact, today`s Icheri Sheher is an inner town of medieval Baku. The outside walls of Baku Fortress reached the sea, stretched for 30 meters and formed an artificial gulf. That`s why ships could cast anchor in Baku harbor near the fortress walls. Ovliya Chelebi, the middle ages famous traveler, in his description indicates that while his visit to Baku in 1656, the inner fortress located outside the city fortress. According to Fuad Akhundov, head of the sector for political studies of the Azerbaijani Presidential Administration, initially Baku was encircled by two walls. The internal wall is almost completely preserved. It was constructed by Manuchekhr II. The construction of the fortress walls - very high on the outside and rather low inside - as well as the building of underground roads and passages show that, while building, ancient masters of Baku used the peculiarities of local relief and rocks very effectively. All these factors improved the field conditions and security of fortress defenders and gave an opportunity for the saving building materials and labor. The outer wall was much lower in height, and was installed by the local ruler, Zufuqar-khan in 1608-1609. A deep ditch surrounded the walls and was filled by underground water in times of danger. The khanate of Baku was annexed to the Russian Empire in 1806. The fortress walls were last used for defense in 1826. At the beginning of industrial exploitation of oil in the 1870`s, Baku grew rapidly. In 1859, the population of the city barely exceeded 13,500 inhabitants, most of whom lived inside the old city walls. In the end of the 19th century one more gate was build near the northern gate of Baku Fortress. Now it calls Gosha Gala Gapysy (the Twin Gates). These gates differ from all other gates in Azerbaijani architecture by their high plastic arts and fabulous ornaments. By 1903, there were 143,000 Baku citizens, and by 1913, the ``black gold`` had increased the population to more than 214,000. The tiny medieval fortress was, of course, too small to hold all these people. Therefore, the outer walls was taken down in 1884, along with the wall on side of the old city facing the sea. Stones from this wall were used to renovate the inner wall.